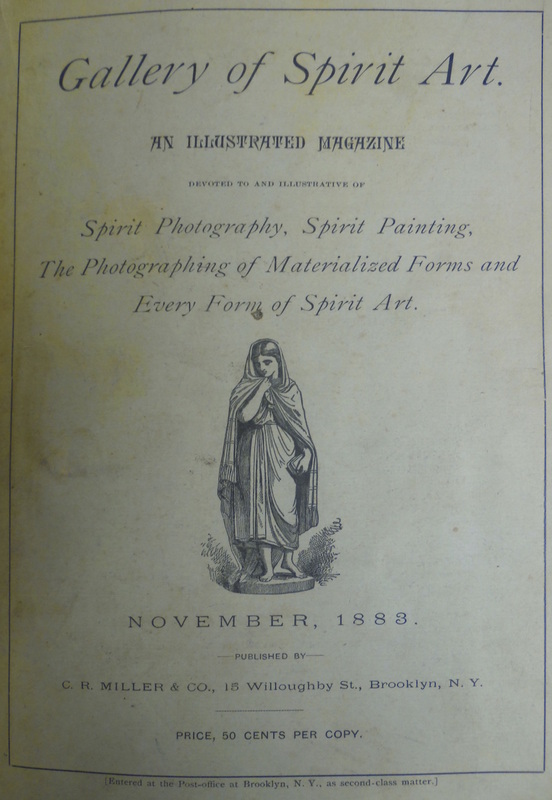 An Illustrated Quarterly Magazine Devoted to and Illustrative of Spirit Photography, Spirit Paintings, the Photographing of Materialized Forms and Every Form of Spirit Art. Brooklyn, NY. Publisher: C R. Miller & Co. Editor: C.R. Miller. 1/1, August 1882-Novenber 1883. 48-66 pp., $1.50/year. The first issue is dated on its title page as May but the cover labels the issue August 1882. This was the complement of Miller's Psychometric Circular. 15 engravings "at a minimum" guaranteed in each issue. This is on the fringe of the materialization phase of spiritualism. It featured discussions (with elaborate illustrations) of art produced by the disembodied and of them in their natural garb and habitat, and photographs of spirits with bereaved relatives. The journal featured the work of Wella and Pet Anderson, Col. James Cooper, Dr. L.H. Nason and General J. Winchester on the "Ancient Band" of antediluvian spirits and their communications with modern humanity in ancient script, and gave considerable space to the creative work of Anna Stewart of Terre Haute, Indiana, in mediating spirits capable of being photographed, and to the paintings of the Scot David Duguid. It carried articles by Anna Kimball giving psychometric readings of Anna Stewart's picture of Mary, mother of Jesus and then defended Stewart when the plate was revealed as a drawing of Mary Campbell, James Burns' "Highland Mary." (The journal commented on the exposure: "This belongs to one of the mysteries which are yet to be revealed," hinting at some sort of reincarnation.) There were also contributions by J.M. Roberts, Thomas R. Hazard, and J.V. Mansfield, and a photograph of Susie Willis Fletcher-all notable advocates of "phenomenal" spiritualism. LOC; NY Historical Society; BL.